Read Day 1 here. We explored Dhankar and Tabo on this day. Next morning, we got up at 6:00am. It was bright, sunny and clear as compared to what we are used to in Delhi or any other metro city in India. Kaza has a kind of stillness you crave for back home. This town did not wake up to cars honking their horns or vendors calling out to sell their wares. It did not wake up to traffic jams and rushed mornings. It woke up just the way a sleepy town does. The mornings here definitely sound different from an extremely urbanized city. I refrain from using the word civilized/civilization, as to me, even the most tribal communities have their own civilization. We choose to refer to them as tribal/traditional just because it is a world that is beyond our comprehension and comfort-zone. After our morning-tea, it was time for us to get ready. We realized that there was no hot water for bathing. (No electricity = no geyser) (Update: I am told that some places now use solar geyser and have a continuous supply of hot water). We requested the kitchen to facilitate us with stove heated water, which they happily obliged us with. I had a conversation with myself and reasoned that it made sense to stick to the naturally available means so that the body becomes accustomed to the changes without much problem. I bathed with running tap water, which was fairly cold. For the day, along with a visit to the Dhankar monastery, we had a trek to the Dhankar lake in our itinerary. We were to spend the night at Tabo, which is at a gradual decline from Kaza. It was a sunny day and the sun in Spiti tends to feel a bit more intense than it does in the plains. So the SPF 70 Sunscreen becomes your best friend. And no, it is not a cosmetic luxury; it is more of a necessity as some of us had our skin peeling off despite the precautions. We started from Kaza at about 9:00am and it took us 1 hour 45 mins to reach the Dhankar new monastery. Dhankar happens to be a cliff village, at the height of 12447 ft above sea level. The plan was to start our trek from the Dhankar new monastery (where our vehicle was parked) to the Dhankar lake. It is a total distance of 2.5 km. We began our trek at about 11:00am. Our guide, Anjaan, estimated that it should take us about forty minutes one way and approximately two hours for the entire trek (including the photo-breaks). The first 450 meters of the trek are extremely steep and require good fitness level for one to go ahead. I noticed that if you have trekking sticks, the whole experience becomes a lot easier. If you plan to buy one, buy these, as these are foldable and consume less space while packing. For treks, more than the physical fitness, you need the mental fitness as it tests your will-power at various levels. On our way up, the group got divided into three sub-groups and it, on an average took us one and a half hours to reach the lake! My only curiosity and the reason for doing this trek was – I wanted to see that how a lake is wedged atop such steep hills and is surrounded by even steeper hills all around. Most of the trek path is barely a foot-wide edge on the mountain slopes. 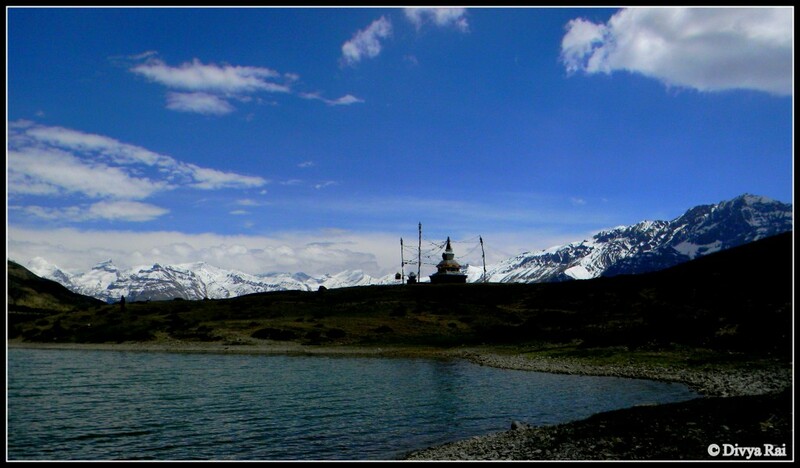 Once you reach the Dhankar lake, you feel various emotions at one go. My first one was a disappointment. It looked like any other regular water body, quite unlike I had imagined it to be. The surrealism bit sinks in gradually and you realize that the beauty is added by the rocky-mountains all around and the snow-capped Himalayas in the backdrop. As you sit and let the surroundings and the landscape sink in, you gradually see the beauty it has to offer. Our guide suggested that we go around the circumference of the lake to enjoy the various perspectives it had. It was a hot day and the uphill trek had made it a bit too uncomfortable for me. I then decided to take a dip in the lake to counter the effects of the blazing sun. The minute I stepped into the water, I think my soul escaped my body for some good 10 seconds. The water was freezing cold. I realized that it was the icy-cold breeze from the snow-capped Himalayas that was making it a lot colder. But once you swim a bit, you feel fairly warmed up. Or you can say when you are neck-deep in cold water, the icy-cold breeze stops being a problem. There are other problems like the slushy bottom of the lake or just staying afloat without touching the bottom at all. Swimming in a lake is very different from swimming in a pool. The depth is often uneven and unpredictable and hence it is advisable that you chart your course as per your level of expertise and stamina. Our guide, of course, was on tenterhooks because of my impromptu decision of swimming in this lake. My other travel-mates (except the one I had requested to stay back with me, just in case some emergency cropped up) had strolled to the other side of the lake to click pictures of the landscape. Once they were done, they waited for us to join them for the trek back to the Dhankar new monastery. The way back was effortless till the last 450 meters, after which, it was a bit exerting on the knees. It also offered amazing perspectives for photography all along. The mountains (both the rocky ones and the snow-covered ones), the meandering river, the Dhankar cliff village, the fields where the village-dwellers grew their cash-crops are factors so poles apart from each other and the fact that they existed in one frame added to the surrealism. It took us one hour from Dhankar Lake to Dhankar new monastery. The time-frame includes the photo-breaks that we took in between. The good thing about the trek was, that despite being cautioned that Dhankar is a medium level trek, all of us attempted and completed it. We took our lunch break at the Dhankar new monastery’s canteen. The place is run by a friendly chap called Maanik. Dhanker, like the entire of Spiti valley had no electricity and hence shakes, pizzas and other things were out of the question. While of course, we were not there to have shakes and pizzas, and here it might look like just two things out of the menu, in reality, a lot of dishes were ruled out. The valley was cut off from the cities (Shimla and Manali) where it gets its ration and refill from, for quite a while post the natural calamity (in Uttarkashi 10 days ago in June 2013). The supplies to the valley yet had not resumed. So the only option was Chai, daal-rice, momos, and thukpa. Majority of us had thukpa. It was a very bland version of what we in the plains are used to, but we quite liked it. I guess that is what a 5 km trek does to you. After the lunch break, the plan was to go to the Dhankar Old monastery, which was on a slight uphill trek. I, along with two other travel-mates decided to skip it as we had various levels of dehydration and fatigue. The other six, along with our guide Anjaan, visited it. Meanwhile, I decided to take a walk around the new monastery. At one place, there were several devices being charged with solar power for usage post-sun-down. It made me mull about the fact that the level of discipline this (electricity or the lack of it) calls for. You charge all the gadgets at one time to survive and make do at other times. Meanwhile, it took the group an hour and a half to be back from the old monastery trek. At around 5:30pm we started from Dhankar new monastery to Tabo. The landscape till Dhankar is quite barren and desert-like. It is only when you hit Tabo that you see a bit of greenery around you. We reached Tabo at around 6:45pm. It is located at a height of 10065 ft. Our guesthouse was called Sonam Homestay. Almost 60% of the population in Spiti is either named Tsering (pronounced as ‘sherring’) or Sonam. If you call out to no Sonam in particular, there are high chances that you might be addressing an entire village in one go. A word about the home-stays in Spiti; the place we stayed at was a proper guest-house with 5 huge amazing rooms. But a lot of places that actually are guesthouses write ‘home-stay’ in their establishment name. The reason for this is that the home-stays in Spiti stand to get some tax-rebates and other benefits. I think that after this rule was made, the government further appended it to ‘any place with more than 4 rooms up for bookings does not qualify to be a home-stay, it is a guesthouse’.This was to ensure that the benefits are passed on to the ones who needed it the most. Tabo is a town with a population of approximately 400 people. We reached Sonam guest House and amazing Mr.Sonam allotted us our rooms. Why I call him amazing shall unfold later. I had a corner room on the first floor which was called Dhankar. We collected our luggage and put it in our respective rooms and assembled in the common area for our evening tea. The menu for dinner was decided to be Spitian Thali, to be served at 9:00pm. Post-tea, we still had 2 hours at hand. Most of us decided to take rest or freshen up. My camera batteries had given up and were in need to be charged. Tabo too, like the rest of the Spiti, did not have electricity and was making do with Solar lamps and power. The village cyber-cafe had solar power back up and I decided to request them to charge my camera batteries at a cost if need be. The batteries were charged and I was not charged for it (pun unintended). I decided to use the internet to make up for the effort he took to make things easier for me. 45 minutes later, the batteries were done and I paid for the internet-usage and left for the guest-house. I also wanted to call up my family and tell them that all was good and under control but the land-lines were yet to be restored. As I was leaving from the cyber-cafe, the owner’s wife offered to accompany me to the walk back to my guesthouse. It was the cloudy moonlit sky in the otherwise total pitch dark night. Spiti valley is relatively crime free, so much so, that it can easily be said to be 100% crime free zone. That is the reason that the lady’s request to accompany me back to the guest-house took me by surprise. But I did not decline the offer, for I felt she knew better. I came back to the guesthouse at around 8:30pm and went to my room, freshened up and joined everyone else in the dining room. It was lit with 4 solar lamps. The dining room, in most of the Spiti home-stays and guesthouses, is with the traditional setup. You sit in the way you would sit on the floor and the food is served on a slightly elevated narrow table that runs almost along the entire perimeter (three sides) of the room. For dinner, we had this amazing Spitian thali. The most outstanding dish for me was the Spitian bread. It was a conch-shaped bread and is made fresh unlike the commercially available breads in the plains in India. 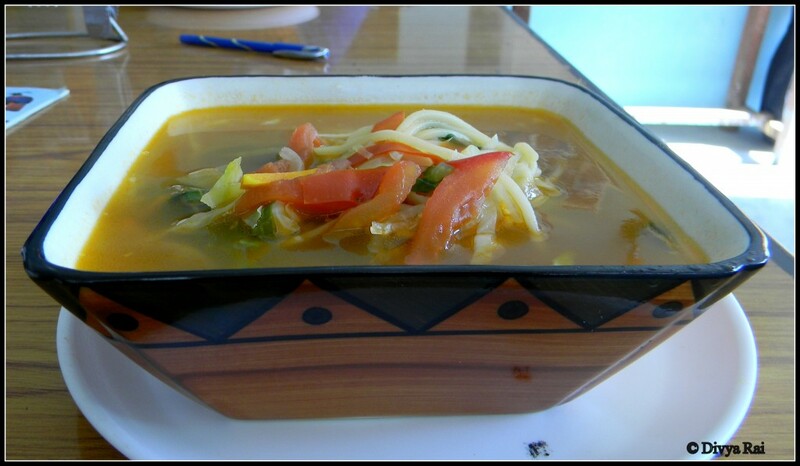 It was something like the Ladakhi bread called Tingmo/timong. It is a kind of steamed bread and is made fresh. 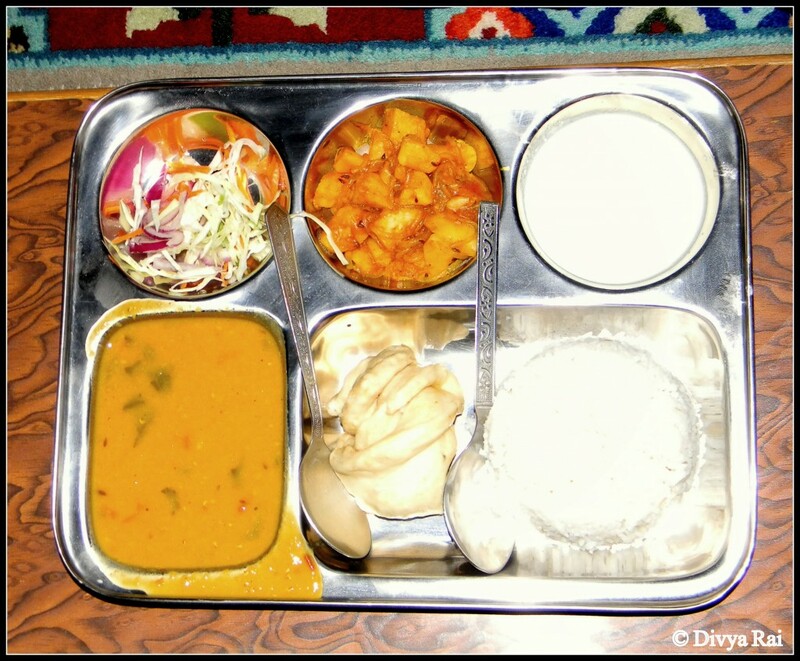 The thaali had daal, steamed rice, potato-glass noodles subzee, salad and curd, apart from the Spitian bread. I have taken a picture of our thaali-contents. This is what I could manage with my P&S camera in almost total darkness. Post dinner, Sonam joined us for tete-a-tete. He played the guitar for us and sang a few bollywood numbers and a local song. He is dedicated to music and is active in preserving the cultural music of Spiti. He told us that there is a music school in Tabo that has a teacher (one of the village seniors) who is the only one left to know the traditional Spitian cultural music. The village people have facilitated the old gentleman to teach the art to the new generation so that the tradition does not die with him. Sonam is actively involved in the development of the village and preservation of culture in general. I was surprised at how he managed time for such pursuits while running a guesthouse and manning its kitchen almost himself. After a bit, we all retired to our respective rooms. The trek had had those body parts hurting, which we didn’t know existed. All I needed was a bed. I had a fever too, probably because of the swim in the cold water. I slept at 10:15 pm or so, but got up in the middle of the night to take an antibiotic and a paracetamol. The fever had me little worried as the next day was scheduled to start at 9:00 am. 2) Rain-coat. Poncho style ones are the best; they cover the backpack as well. 4) Pain relief cream; I use Volini. 5) Torch; this one is much value for money than the one I bought for myself at Rs.800 as a last minute purchase. Kaza is the commercial capital of Spiti. Beautiful, quite and quaint location. The body experiences a general tiredness at all times.